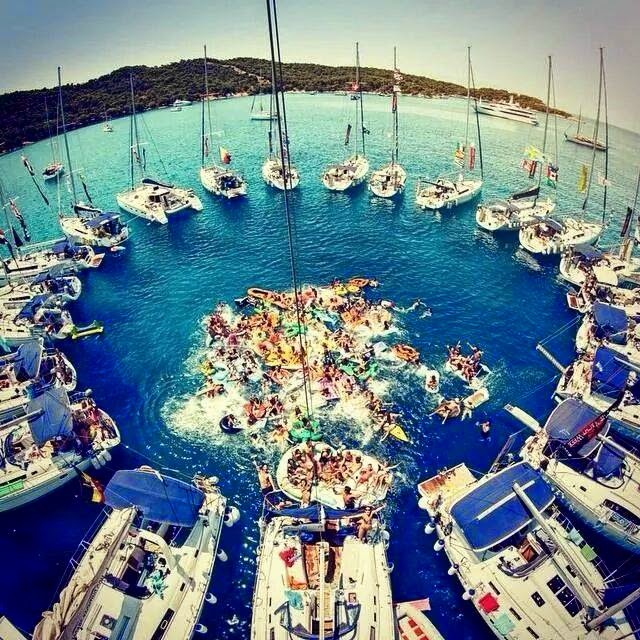 Have you guys heard of The Yacht Week? crystal blue ocean views. I definitely would recommend Mykonos. up, Athens. Sarah and I actually were SHOCKED at the state of Athens. 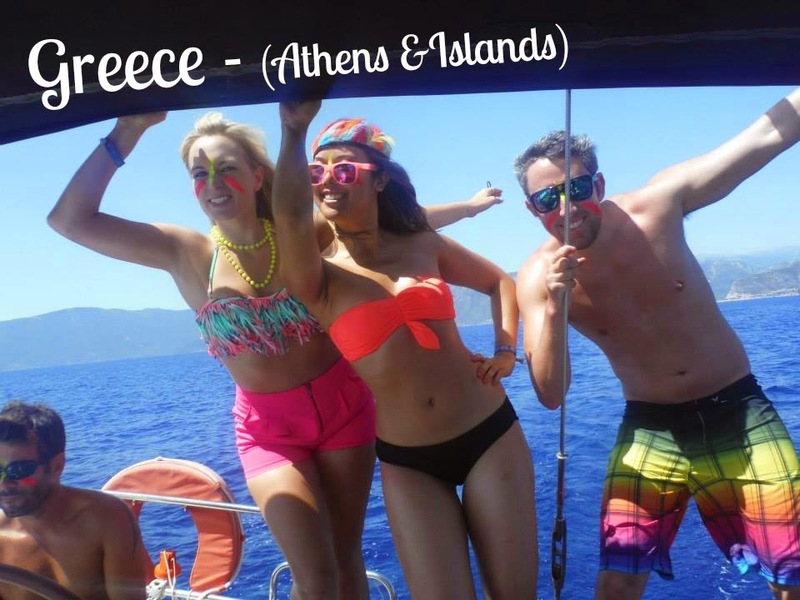 Outfit: Greece in the summer is HOT… and I mean H.O.T. So, I basically lived in cotton tee’s, skirts and Grecian sandals. This J Crew Factory skirt is my go-to for traveling in hot climates! and coverups for an entire week! This was a CRAZY activity called “Heli-Yachting”. In Heli-Yachting you stand on the side of your yacht with the buoy between your legs. The captain starts gunning it and tells you to jump. Right when you jump he cranks the boat hard sideways and so you make a semi circle over the water while on this buoy. The trick is making sure you jump off and land in the ocean before you complete the semi-circle, otherwise you’d hit the side of the boat! 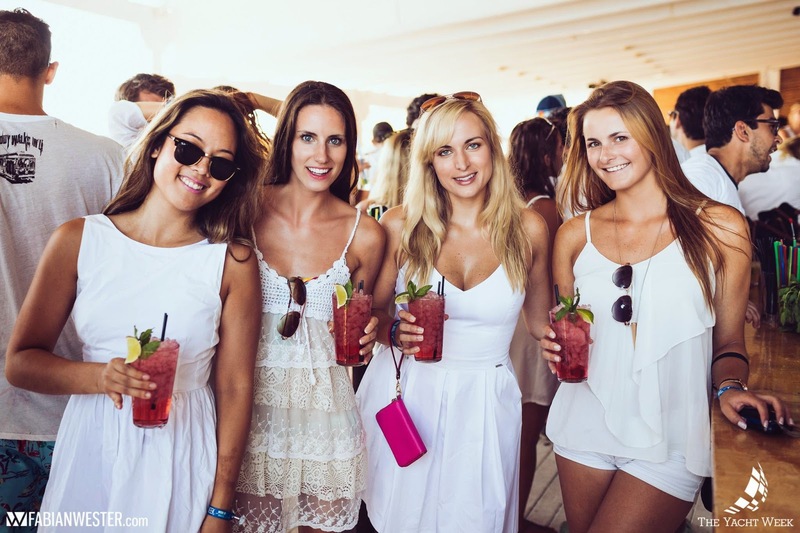 Probably my favourite party of The Yacht Week was the “All White Party”. We moored one afternoon on an island and had this party in a bar on a cliff overlooking the ocean. Sidenote: The drink in our hands is a raspberry mojito and it was BY FAR the best drink I have ever had. Yummmmm. My favourite island that we visited was Hydra. The coolest thing about Hydra is that there are NO cars on the entire island. The mode of transport? Donkey. I kid you not I even saw an “ambulance” donkey who had a little sign indicating he was the medical transport. I am kind of bold when it comes to adventure travel (definitely something that has got me in trouble once or twice haha!) So, of course I had to try crazy jumps like the one in this picture when we went cliff jumping one afternoon! Thanks for reading my Travel & Fashion post!! I’ll be periodically posting “Travel & Fashion” posts when I travel to new destinations. I would love to hear what you guys like and don’t like about these posts so I can make them the best they can be!! Check out my newest blog about Athen. Sorry, let me try that comment again – somehow along the way I ended up with a mess of a comment. What I was trying to say was: I would love to go to Greece! It's been on my top 5 places I must visit for years now, and seeing your photos makes me want to go even more!